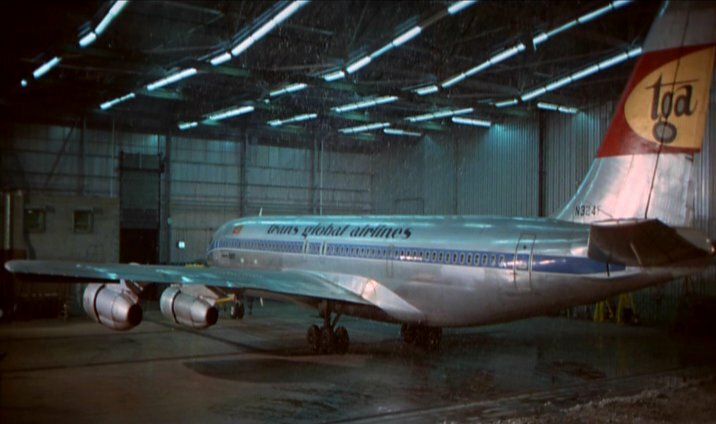 Boeing 707-349C N324F as it appeared in the original 1969 Airport movie in Trans Global Airlines colours wearing its real registration N324F. The aircraft was even referred to in dialogue as "324". During 1970/71 the aircraft operated on lease to Qantas as VH-EBZ City of Swan Hill. "Shove an undamaged aeroplane with snowplows? Mel are you outta your mind?" A black and white publicity still from the original 1969 Airport movie. 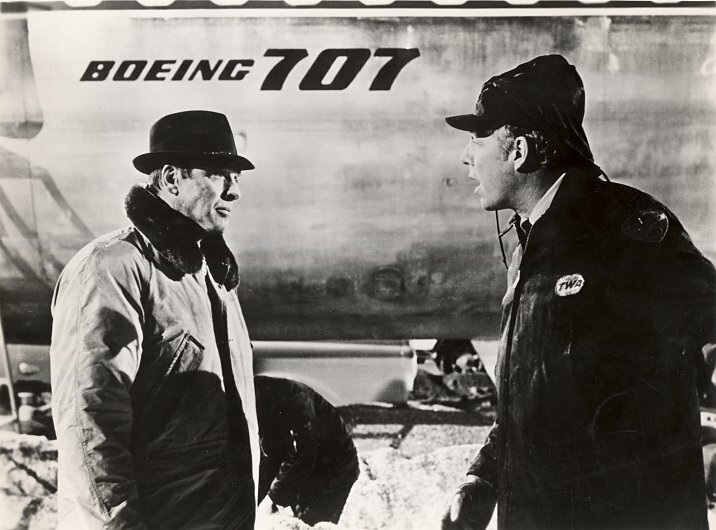 Manager of Lincoln International Airport, Mel Bakersfeld (left, played by Burt Lancaster) has just told Joe Patroni (George Kennedy playing a trouble-shooter on loan from TWA) that he intends to move the bogged Boeing 707 N324F using snowplows. And yes, Patroni does say aeroplane not airplane. Vern Demerest Dean Martin Captain, Trans Global Airlines. Joe Patroni George Kennedy Trouble-shooter engineer on loan from TWA. This photo was probably taken in a studio mockup of the cabin of N324F. It is suspected that some absent cast members were represented by "cardboard cutouts" in those pre-Photoshop days! 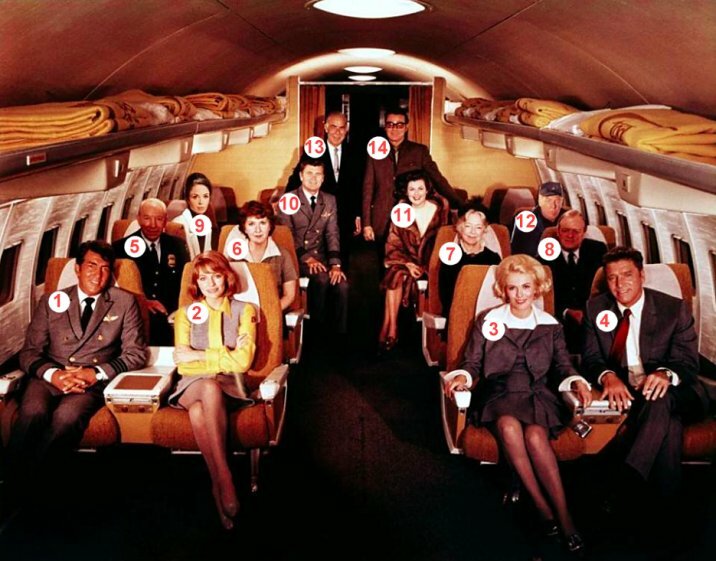 Not included in the photo, but who should have been, was the film's Technical Adviser, Captain Lee Danielson, who it is believed was a TWA Captain. Airport scenes were filmed at Minneapolis-Saint Paul International Airport. A no good irresponsible louse who can't pass up the opportunity to knife me. Due to a Cetcil wind, Dystor's vectored us into a 360-tarson of slow air traffic. Now we'll maintain this Borden hold until we get the Forta Magnus clearance from Melnics. That's one nice thing about the 707. It can do everything but read. Remind me to send a thank-you note to Mr Boeing.